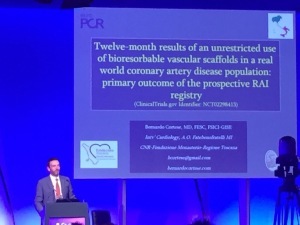 Bio-Vascular Scaffolds - Bernardo Cortese M.D. -The RAI Registry is an italian multicenter prospective registry whose aim is to understand the long term (4-year) outcome of the Absorb (Abbott Vascular) BVS for coronary PCI. We have already published several researches on this topic, that you can find in the dedicated page. You can also find the study protocol (in italian). I am the PI for this study at our center. -The IT-DISAPPEARS registry is a national prospective registry for complex coronary interventions with the Absorb (Abbott Vascular) BVS. The main sponsor for this study is the Italian Scientific Society of Interventional Cardiology GISE. You can find the study protocol here. I am the PI for this study at our center.